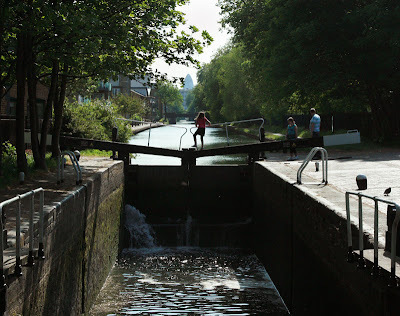 The old ford lock controls the water between the Hackney Cut and the tidal Lea River. In the east looking back toward central London. In the background you can see the 'Gherkin' (a sky scraper in the financial district). Oh i like this picture a lot a lot!!! Reminds me of lazy days of summer. Great shot! Very summery and bright. It's a wonderful photo. I love little canals like this. Good pic, as usual. We are spoilt by your great images of London, Mo. "The Gherkin", you can practically see it from anywhere in London!It is in several of my photos taken in so different and far places. Yes, it has become one of the modern landmark of London. This shot takes me right back to last summer, when I sailed on a narrowboat on the canals between Birmingham and worcester. I opened and closed 117 of these in a week. It did work up an appetite. Nice photo! Such a rural looking scene but with evidence of the big city on the horizon. great blog and great pictures, just came across your blog and i'm enjoying scrolling through your great shots.keep up the great work. Great photo, especially with the Gherkin in the distance. Same here as for Marley: a narrow-boat holiday sounds ideal. What a treasure to have a delightful spot like this in such close proximity to the city ... shall venture that far West next time I am over your way.